(Photo: Reuters / Shannon Stapleton)U.S. Republican presidential nominee Mitt Romney (L) meets with Rev. 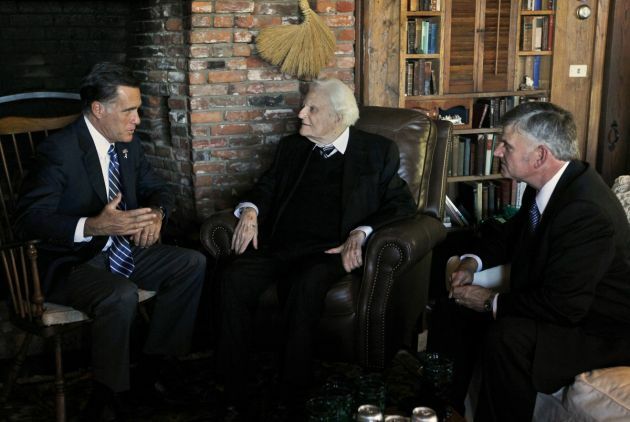 Billy Graham (C) and his son Franklin (R) at his home in Montreat, North Carolina Oct. 11, 2012. An effort in the last week to make Christianity the official religion of North Carolina was thwarted by legislative leadership. A spokesman for N.C. House Speaker Thom Tillis said Thursday that the chamber will not officially hear legislation intended to link Church and State. "The bill that is getting so much attention is not going to move," said Jordan Shaw, spokesman for Speaker Tillis. "It's dead." Shaw said the resolution may go to committee due to procedure, but there is no chance the General Assembly will ever vote on it. Controversy arose this week when state legislators from Rowan County, N.C. presented a resolution claiming to protect religious freedom in the county. In response to a lawsuit against Rowan County commissioners who begin each open meeting with a spiritual Christian prayer, Rep. Carl Ford and Rep. Harry Warren, both Republicans, filed a resolution into the General Assembly intended to protect the religious custom. However, the measure also went much further when it acknowledged that while the U.S. Constitution prevents Congress from creating an official religion due to the First Amendment, there is no such limitation on a state. The legislation contends that the First Amendment does not apply to state law. "The North Carolina General Assembly does not recognize Federal court rulings which prevent the State, its public schools, or any political subdivisions in the state from making laws respecting the establishment of religion," the resolution said. In effect, the resolution could be interpreted to say that neither the Bill of Rights (nor the Fourteenth Amendment which courts have used to bind states to the Bill of Rights) is not applicable to state government. Ford and Warren spent a day defending the language in their resolution. "We're not starting a church," Ford said to the Salisbury Post, a local newspaper. "We're not starting a religion. We're supporting the county commissioners in their freedom of speech." Despite the legislators' protests, other conservative and right-leaning evangelicals have distanced themselves from the resolution. Evangelist icon Franklin Graham even told the Charlotte Observer that he thought the resolution went too far in establishing a state religion, though he supports allowing commissioners to hold prayer. Thomas Currie, the Dean of the Union Presbyterian Seminary at Charlotte shared related thoughts on the matter. "I think the establishment of a religion is deadly," Currie said. "Not just deadly for people who are not of that religion, but it's deadly to the religion itself." He added that faith is only really vital when it is able to stand on its own.